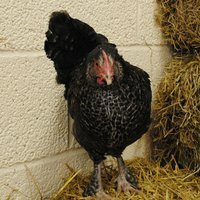 A traditional farmyard Speckled Hen being a Maran/Barred Plymouth Rock cross, the Speckled can be a very docile hen, slightly larger than the others, she is an excellent layer of slightly darker eggs. 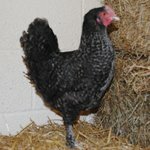 Her black, grey and white dappled plumage makes her an attractive timeless beauty. 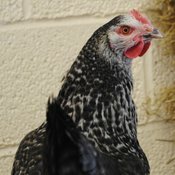 The Speckled will lay around 270 eggs in her first year. So don’t take my word about this wonderful girl pop in to the shop and see for your self.